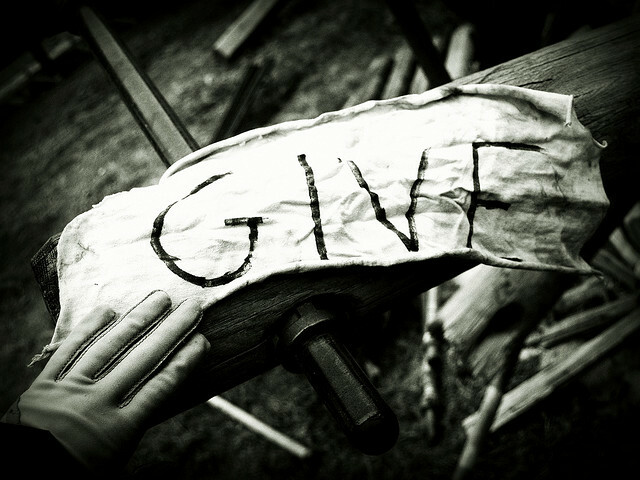 Give comes in all forms. Image by Carson 2007. If Super storm Sandy has taught us anything–other than the East Coast needs an adequate levee system–it’s to be grateful for what we have. And despite the fact that thousands are left with little of their former lives, it’s nice to know neighbors, family and friends are helping to restore some of what was lost by giving. It’s easy to throw a credit card, check or even cash at someone (Btw, all are acceptably and greatly appreciated.) but it’s even better to be there. It took me nearly three hours to reach my grandfather’s house in Rosedale, Queens from Brooklyn, but nothing could prepare me for the devastation. It wasn’t the flooded out basement or the overflowing garbage bags that lined the collapsed white picket fence in the backyard. The image forever engraved in my head is my grandfather’s hunched over shoulders and sagging eyes looking at me with tear-stained cheeks. At that moment there was no check big enough to cash the amount of gratitude written on my grandfather’s face. Time is a precious commodity, use it wisely and hopefully enough that others will Thank you for giving. 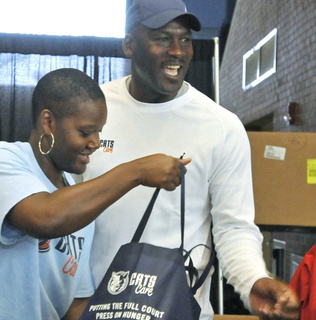 Michael Jordan giving time to hand out Thanksgiving dinners. Davie Hinshaw 2012. ===> Michael Jordan helped give out Thanksgiving dinners to at-need families in Charlotte, NC this Tuesday. ===> Nicki Minaj took a break from promoting her new album, Pink Friday: Roman Reloaded The Re-Up and talked to kids at her alma mater, P.S. 45 in Queens to encourage them to stay in school this Monday. The self-proclaimed Barbie also teamed up with radio station Hot 97.7 to for a Thanksgiving turkey giveaway, and donated nearly $15K to the Food Bank of New York City.